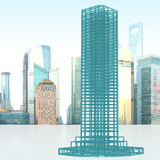 SNAP is a program specialized for Elasto-plastic dynamic response analysis, incremental analysis, stress analysis on the structural member of the building structure in arbitrary shape. With its superb operability and high level analytical function, it is capable of having speedy data input to outputting analysis result. There are no limitations to the building structure’s size or the data, it can process speedy calculation of complicated structures. This program have variety of functions that can support designing the high-rise structure, vibration control structure, seismically isolated structure and all types of structures.